Dublin's planning has been based on urban sprawl since the arrival of the car in the early 20th century - results - destruction of the outlying urban villages (Howth, for example), spread out suburbs with scattered bland shopping centres that are entirely car dependent. In the City Centre, working class areas declined as manufacturing disappeared, and there is a counterbalance between urban collapse in O'Connell Street, with ten minutes away the half baked yuppie docklands development offering clean, sparse urban spaces for those who can afford it. Pubs have been gutted out of use, with no planning protection them at all, leaving inner city residents without places to gather. Is there any future at all for O'Connell Street? Predatory purchases by developers and their incapacity to redevelop it have left it now was a mainly empty hulk. The road lanes in O'Connell Street are a speedway and the central walkway a pretty useless space. Attempts at pedestrianisation European style don't marry well with a population that mainly lives in areas completely dependent on private cars. There is a desperate housing crisis, but Dublin City Council has again cut property tax and have in any case been denuded of powers, will and capacity to build social housing. I still often walk through Dublin lifted up by its lovely streets, squares, parks and quays, and love some of the new development, but can any city succeed if it is only an enjoyable place to live for the wealthy and if it abandons some of its main historic streets to decay ? Without more density in the city centre i think we will either end up with a completely hollowed out city where you have a few deprived neighborhoods that are severely lacking in any services or else an entirely gentrified city centre where only the wealthy can afford to live. We are not going to see any major programme of building social housing in the city centre anytime soon so if you want affordable housing options you need density, this also needs to be supported by investment in community and transport infrastructure which greater density could actually provide the funding for by way of additional development levies. I can understand the desire to protect the Georgian character of parts of the city but there are plenty of brownfield sites that could be used for high rise without impacting on that. Around the Blackpits area in particular and right across D8 there seems to be a lot of under utilised land. In the last development plan for Dublin, Councillors voted to reduce maximum floor heights. This change in policy meant that developments designed under the old plan could not be built when demand rose in Dublin. They didn't say where people should live instead. What would you think about a Manhattan style loop of high rise residential development around Phoenix Park ? To be honest, I would favour CPO of some areas of low density suburban development of the 20 century, around Phoenix Park, and replacement with a high rise mainly residential zone. There would be need for an integrated area plan including a transportation plan, new schools etc. but a lot of people would be able to walk or cycle across the park. Heuston mainly provides public transport to the counties outside Dublin. I don't really get the idea of why it was considered a suitable location for high rise. The Councillors make the Plan. The lack of high buildings is down to them. Except in a small number of places you cannot exceed 28 metres within the canals - lower outside. It makes no sense in terms of commercial development. The Councillors were right in my view to oppose some speculative high rise development. But a blanket policy on heights across the city isn't helpful. There is a need for higher densities and more public transport in the City. I'd be in favour of one or maybe two clusters of high rise development, edge of centre, not a splattering of random high spots. Dublin's historic townscapes should be maintained, the same .as happens in every other European city. The new (Draft) Urban Development and Building Height Guidelines for Planning Authorities will, if adopted, outlaw 'blanket' height restrictions - correctly in my view. The National Planning Framework published July 31st said that building heights in urban centres should be 'performance related' - new jargonese for profit-related. Irish planning to its credit up until now has excluded viability as a justification for lowering planning quality standards. Fine Gael and their various adherents are using the housing crisis which is largely of their own creation as a sledgehammer to smash up the planning system and bring in a developer-led free for all. 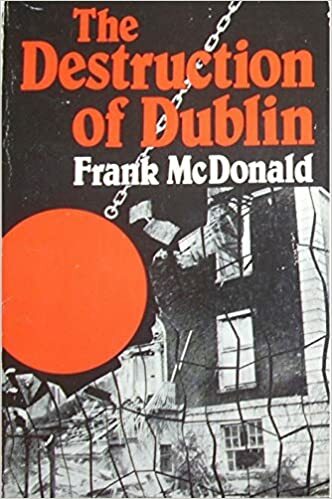 The Destruction Of Dublin, as detailed by Frank Mc Donald in his book of the same name was mainly an FF job. It has become fashionable to blame FG for FF's ****-ups. That's because they [FF] have become the Liverpool FC of Irish politics, once regular winners but now consigned to the mediocrity of sometimes nearly men. I mean look at that front bench, Dara Calleary, Timmy Dooley & Ann Rabbitte? Now its important to blame someone who might be actively pursuing some objectives -so FG are getting the blame for it all. Well, back in 1985 when the book was published, yes, it was. Unless you count in the shelling of the Four Courts and the earlier shelling in 1916. It's hardly relevant to what FG has done since coming to power. Starting with chaining the public to liability to pay the private bank debt, and flogging off a large amount of land and property to US oligarchs and hedge funds.... and now, destroying the planning system to facilitate the same entities building wtf they like all over the centre of Dublin. I think I understand where you are coming from on planning - it's wise to be vigilant - but the daft 'blanket' 28m height limit for most of the city is just that - daft. It's based on an arbitrary limit of 4m per floor commercial = 7 floors. For a decade the docklands laboured under an equally stupid blanket height limit, leading to a boringly uniform parapet level and roofscape, only now being remedied. What about rooftop plant? What about the environmental requirements of NZEB (bigger rooftop plant). What if you could build to 30 m without any negative environmental impact - why have a limit of 28? Why not 40m subject to the standard assessment? There are massive safeguards to prevent buildings that are too high for their context. The Liberty Hall proposal of a couple of years ago was refused because of these environmental safeguards - ditto the latest Tara Street proposal - even though the height was permissible in the Development Plan it was refused due to visual impact.